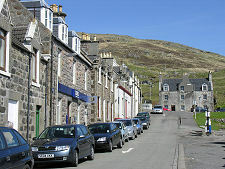 Castlebay is the village capital of Barra, the jewel that lies almost at the foot of the Western Isles archipelago. 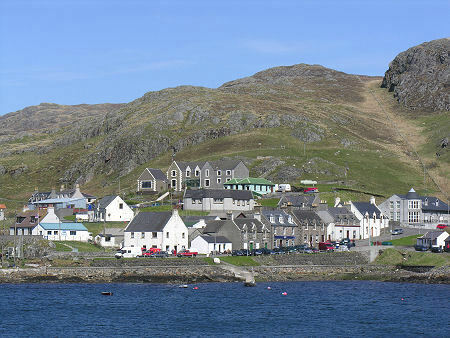 Most visitors to Barra will find themselves in Castlebay sooner rather than later, enjoying its beautiful setting, relaxed atmosphere and friendly residents. 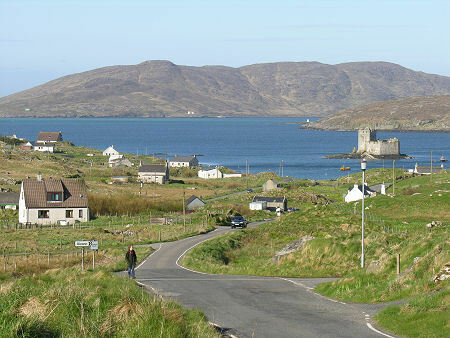 Except for those who arrive via the beach airport on the northern side of the island, visitors have traditionally come to Barra, and left it, via the ferry that links Castlebay with Lochboisdale in South Uist and with Oban. 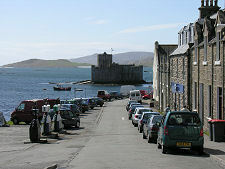 In recent years the Sound of Barra Ferry to Eriskay provided a more direct and much more frequent route to the rest of the Western Isles from the north of Barra, but Castlebay remains the island's front door. The story of Castlebay is deeply entwined with the story of the the Clan MacNeil and of Kisimul Castle, the castle in the bay after which Castlebay takes its name. Barra was granted to the Clan MacNeil by Alexander, Lord of the Isles, in 1427. The clan held on to it for 411 years, despite the intermittent efforts of their neighbours, until Roderick MacNeil ran out of money in 1838, and sold Barra to Colonel John Gordon of Cluny. In 1851 Gordon brutally cleared much of the island of its residents (something he also did in other parts of the Western Isles) to make room for sheep. But while this story has a resonance with many others across the Highlands and Islands of Scotland, it has a more positive ending. In 1937 the American architect Robert MacNeil, who had been recognised as the 45th Clan Chief of the MacNeils, visited Barra soon after the opening of the airstrip on the island. He purchased most of the Barra estate lost in 1838. 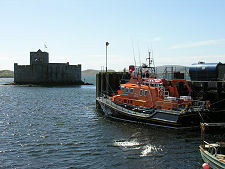 In 2000 the current laird, Iain MacNeil, leased the restored Kisimul Castle to Historic Scotland for 1,000 years for a rent of a bottle of whisky and £1 a year. And in 2003 he started a process that will lead to public ownership of the whole island, at no cost. Colonel Gordon died in 1856, not greatly missed or mourned by the islanders who remained. The next get-rich-quick scheme had rather more benefits for the local population, and from 1869 Castlebay became the centre of a fishing industry that rapidly saw 400 small fishing boats based here, together with the associated gutting, curing and preserving facilities. By 1894 there were three steamers a week linking Castlebay with Oban, and the Castlebay Hotel had been opened. 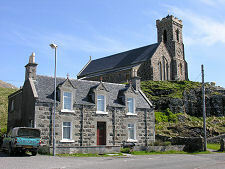 The Church of Scotland that was built overlooking the harbour on this predominantly Catholic island in 1892 did not thrive: the building remains today, but is disused. The Catholic Church of Our Lady Star of the Sea, built in 1889, has fared better. 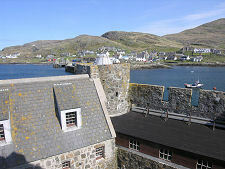 A turning point in Castlebay's fortunes came with the filming here of Compton Mackenzie's Whisky Galore in 1949. 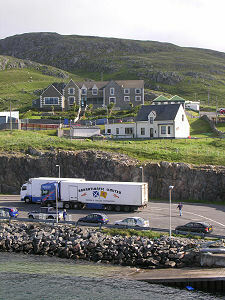 The events behind the story were based on nearby Eriskay, but the British Film Industry's version put Barra on the map. 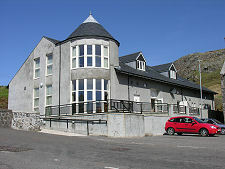 It also kept the Castlebay Hotel fully occupied throughout the period of the filming. 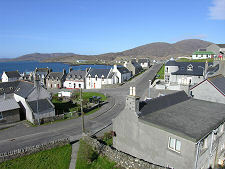 Castlebay today has two hotels and a number of guest houses and B&Bs, plus a range of shops, a bank, a petrol station and a hospital. And since 1992 Castlebay High School has provided full secondary school facilities. 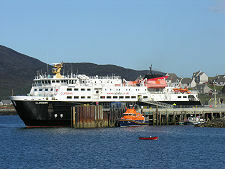 Until then Barra pupils studying for Highers had to board in Stornoway and attend school there. Towards the west end of the village is Dualchas, the excellent Barra Heritage Centre.